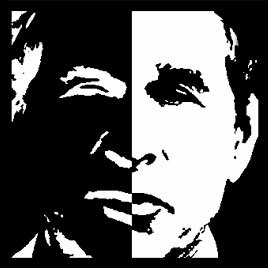 This graphic is part of a new Democratic Party initiative to focus on the “two-facedness” of George W. Bush, which is apparently conceived broadly. The thing the graphic most reminded me of was Bush’s angry performance at the Cabinet meeting that discussed Fallujah in early April of 2004, where Newsweek says he commanded, “Heads must roll!” His temper and recklessness in such key moments contrast vividly with the folksy image he projects on the campaign trail. Over 600 Iraqis died, many of them women and children, from aerial bombardments and tank assaults on residential areas that had not previously been directly involved in the insurgency.